During the first 5 policy years “Sum Assured on Death” will be paid to the nominee. After completion of 5 policy years but before the date of maturity: “Sum Assured on Death” andLoyalty addition (if any) will be paid to the nominee of the Life Assured. An amount equal to 50% of Basic sum assured will be paid to the nominee. If life assured survives to the specified duration during the policy term, then a fixed percentage of Basic Sum Assured is will be payable to the life assured. 40% of Basic Sum Assured in Policy terms 20 and 24 years. If this benefit is opted for, an additional amount equal to “Accidental Benefit sum Assured” is Payable on death due to Accident, provided the rider is inforce at the time of the accident. In the case of the accidental permanent disability (within 180 days from the date of accident) an additional amount equal to “Accidental Benefit sum Assured” is Payable in equal monthly installments spread over 10 years. The future premium will be waived for the accidental benefit rider and premiums for the portion of Basic sum assured will be waived. This rider can be taken at the inception of the policy or before the premium term is over. If this benefit is opted for, an additional amount equal to “Term Assurance Rider sum Assured” is Payable on death to nominee, provided the rider is inforce at the time of the death of the Life Assured. This rider can be taken at the inception of the policy. Following rebates to proposer is available on the premium if he/she opts for the higher mode and take the high-risk cover policy. Loan facility is available in this plan, after the payment of premium for at least full 3 years. Nomination and Assignment are allowed in the policy. 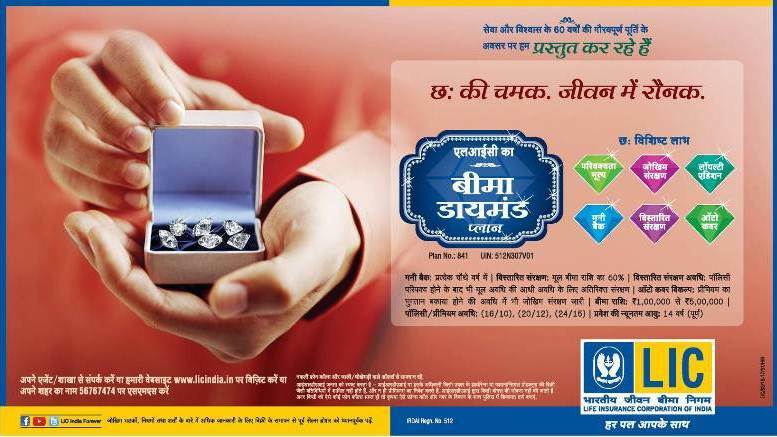 Be the first to comment on "LIC’s New Plan Bima Diamond (Plan No. 841)"